Update March 16th, 2018: PBCS is turning into a PITA. After OPSGROUP input, we have an update on the latest status including rumours of delays, A056 LOA’s, and Aircraft that have failed to comply with PBCS. ICAO is introducing another acronym in the North Atlantic Region. This time, it’s PBCS (Performance Based Communication and Surveillance), and from March 29th 2018 you will need to be compliant if you want to fly on the half-tracks between FL350-390. Initially, there will only be a maximum of three daily tracks where you will need to be PBCS-compliant between FL350-390. These will likely be the same tracks as we currently see being assigned as ‘half-tracks’ each day. This requirement will eventually be extended to all the NAT tracks between FL350-390, but we understand that will only happen when the filing of PBCS designators on flight plans reaches the 90% mark, or 28th March 2019 – whichever comes first. Either way, the ‘transition period’ for this PBCS implementation is set to last six months, so the roll-out of the requirement to all the tracks won’t happen until Oct 2018 at the earliest! 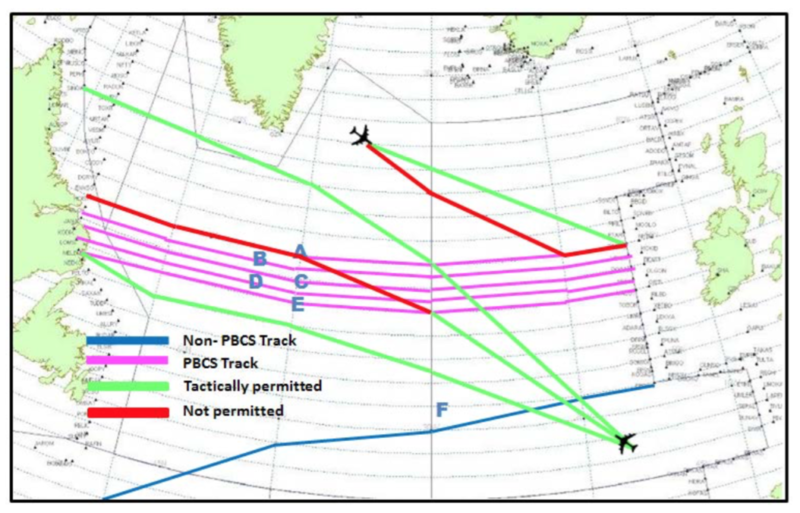 But from March 29th 2018, Shanwick and Gander will basically just continue the concept used in the RLatSM trial – whereby daily tracks spaced at less than 60nm from an adjacent track will be specified as a ‘PBCS Track’ and will be notified in the Track Message Remark-3. RLong – Reduced Longitudinal Separation Minimum: in the Shanwick Oceanic Control Area (OCA), longitudinal separation has been reduced to 5 minutes between aircraft following the same track. When these trials end, PBCS standards will be introduced to continue to allow the application of both reduced lateral and longitudinal separation for aircraft that meet the Required Communication Performance (RCP) and Required Surveillance Performance (RSP) specifications. How do I comply with PBCS standards? To operate on the PBCS tracks between FL350-390, you will need to be RNP4 compliant, with CPDLC capable of RCP240, and ADS-C capable of RSP180. Do I need PBCS approval from my state of registry? PBCS approval will differ depending on which country operators are from. For UK operators, check the requirements here. What new codes do I need to put down on my flight plan? FANS 1/A CPDLC equipped aircraft planning to operate in the NAT HLA shall insert the appropriate designator (J2, J3, J4, J5 and/or J7) in Item 10a of the flight plan. FANS 1/A CPDLC RCP 240 compliant aircraft intending to operate in the NAT HLA shall insert the designator P2 in Item 10a of the flight plan. FANS 1/A ADS-C compliant aircraft planning to operate in the NAT HLA shall insert the designator D1 in Item 10b of the flight plan. FANS 1/A ADS-C RSP 180 compliant aircraft planning to operate in the NAT HLA shall insert SUR/RSP180 in Item 18 of the flight plan. RNP 4 compliant aircraft planning to operate in the NAT HLA shall insert PBN/L1 in Item 18 of the flight plan. If I’m not eligible for PBCS, where can I go? You can climb or descend through levels FL350 – FL390 on a PBCS track provided the climb or descent is continuous. For a great FAQ on all things PBCS, check out the latest FAA document here. For more info on the PBCS implementation, check out the full UK AIC here. To figure out where you are welcome on the NAT, depending on what equipment and training you have, check out our quick reference guide here. Special thanks go to Mitch Launius at 30westip.com for help with this post. For assistance with international procedures training for business aviation crews worldwide, and to watch an excellent webinar about all things PBCS-related, check out the 30westip.